The Bottle sling (or Jug sling) is a knot which can be used to create a handle for a glass or ceramic container with a slippery narrow neck, as long as the neck widens slightly near the top. 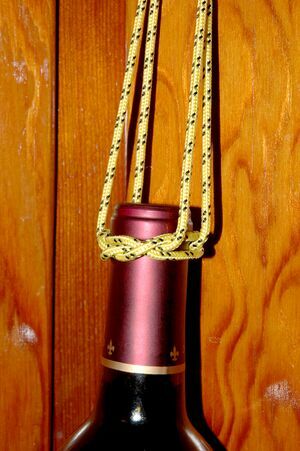 With appropriate size cord, most wine bottles can be reliably suspended with this knot. The Bottle sling, the constrictor knot, the strangle knot, and the miller's knot (roughly in order of decreasing gripping power) are similar in that, when tightened around a cylindrical object, they maintain their grip on the object after the ends of the rope are released. The more intricate Bottle sling allows the cylinder, assuming it has even a slight flare or collar, to be lifted along its axis. The method for tying the Bottle sling is similar to the loop-and-weave method used to tie the Jury mast knot and the Trumpet knot. The knot is begun by making a bight in a piece of rope and folding the bight back on itself to make two separated loops that are mirror images of each other. Lay one loop on top of the other so that they overlap slightly and create a cat's eye shaped hole above a triangular shaped hole between the two loops. Make a bird's beak with your index and thumb and weave them down through the top loop, up through the cat's eye and down through the bottom loop, bunching the coils of rope against your fingers. Pinch the section of rope that was the bottom of the triangle and flip the coils over the pinched section. The flip may take a little practice, but the pinched section should become a short bight hanging off a circular shaped knot. The resulting knot makes a circle that can be dropped over the top of a bottle. Pulling the bight and the running ends firmly will tighten the knot against the neck of the bottle. Looping the running ends through the bight will make a sling that grips and can be used to lift a glass bottle even if it's wet. This provides a convenient method of lowering a beverage bottle from a boat into the water to chill. The Arts of the Sailor. Hervey Garrett Smith. Dover 1990. Knotcraft. Allan and Paulette Macfarlan. Dover 1983. Knots and How to Tie Them. Boy Scouts of America 1992. The Morrow Guide to Knots. Mario Bigon and Guido Regazzoni. Quill/William Morrow 1982. This page was last edited on 26 December 2009, at 19:12.